Wow - we keep finding great places for you to stay! You will enjoy this one! Open Hearth Lodge is a well-maintained property in Sister Bay in Door County. The hosts, John and Nora Zacek (who took over the lodge in 2004), are committed to ongoing lodge updates and enhancing their guests’ experiences. 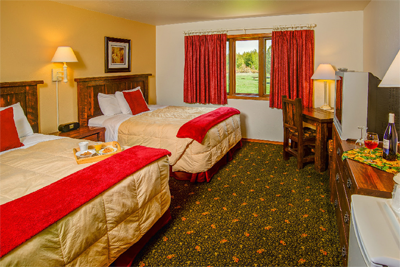 Rooms have been recently been updated with new flooring—carpeting or laminate flooring. We also learned during our summer 2011 updated review of this property that many rooms have new linens with pleasant and popular colors as well as lovely dark wood furnishings. New furniture is planned for many more accommodations as well. There’s a new breakfast room (including tables and chairs for guests’ convenience) as well as expanded continental breakfast menu. They are constantly updating the property, which we like to see. In 2015, 12 more rooms opened up in a new wing, and there is an elevator there too. The rooms are very nice, as we just toured them and met with Nora again. Even the lodge’s sign—made from logs—is new and eye-catching. We found the two lodge rooms with king-size beds and whirlpool lovely. They have dark wood furnishings, nicely accented by lime green and white linens. These rooms also have a microwave and coffeemaker. Couples who like to relax in their room, making coffee in the morning or a snack at night, will truly enjoy these accommodations. The whirlpool tub is in the bathroom, also decorated with neutral tile and a vessel sink. Meanwhile, the lodge rooms with two queen-size beds may be the choice for families and others. There is new carpeting or laminate flooring in updated colors as well as coordinating bedspreads. Having extra pillows on the beds is a nice touch. 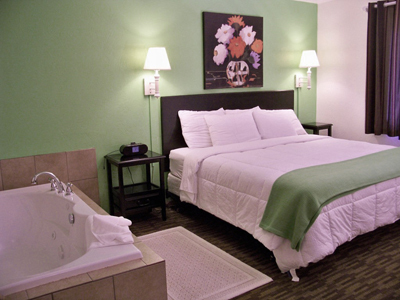 A couple rooms are available to people traveling with a small pet. They must be reserved in advance. Still another special accommodation is the two-bedroom and two-ba throom unit. This is a wonderful space for two couples traveling together. There is a foyer and sitting area (outfitted with a sofa sleeper and electric fireplace). Two bedrooms are on opposite sides of the sitting area—each has a king-size bed, and one has an adjoining bathroom with a whirlpool tub and another has a bathroom with a large shower. This unit is also equipped with a large refrigerator, hot plate, microwave, coffeemaker and dishes. In 2015, an additional 12 rooms opened up in a new wing, along with an elevator. We toured Room # 113B, with a king bed and whirlpool. This rooms connects with another room with a king bed if you'd like both rooms. Very bright. #113A is the connecting room that is a one bedroom, with a living room, kitchen (fully equipped), fireplace and flatscreen TV. The bedroom, with a kig, has a whirlpool. Very nice. This is a welcoming place from the get-go. With a name like Open Hearth, you bet there’s going to be a fireplace here. And it’s right near the entrance in the tastefully adorned sitting area. Also, for guests’ convenience, there’s a computer. Nearby is a painted mural by Patty Clark, a Sturgeon Bay artist. The lodge, which is open year-round, has an indoor pool (with depths from three to five feet) and adjacent outdoor patio. There’s a whirlpool, too. The lodge sits on six acres in Sister Bay. Outdoor amenities include a fire pit, ¼ mile nature trail, grassy areas and playground. 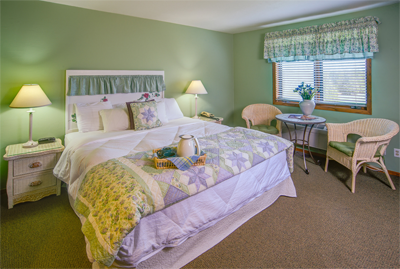 But when it’s time to leave Open Hearth Lodge for fun in Door County, we believe you’ll find this location convenient. The lodge is south of Sister Bay downtown, and south of the intersection of Hwy 42 and Hwy. 57. So, people who want to head south on Hwy. 57 to the lakeside can easily do so. A paved trail abuts the Open Hearth Lodge property and will take guests north to Sister Bay downtown area, where there are some new attractions including Waterfront Park and a skateboard park. The hosts, who personally enjoying biking Door County, like to share their favorite routes with their guests - so ask them! They also advise heading to the state parks, enjoying a fish boil and taking a drive to enjoy the scenery.